The current economic recession has led parents to harbor strong doubts about the next generation's quality of life in the future, a new CBS News poll reveals. Yet in spite of a general sense of doubt, a large majority of parents are optimistic of their own children's future opportunities. Along with concerns about the future, the recession has created current hardships for families, the poll shows, with many parents finding it harder to pay for basic necessities like food or utilities. This hardship has created stress for both parents and children but has also created some opportunities for families to spend more time together. When parents are asked about life for the next generation -- not specifically their own children -- 41 percent say their future will be worse. Only 22 percent say it will be better, while 32 percent think it will be the same. Nevertheless, parents remain relatively optimistic about their children's financial future. Nearly eight in 10 say it is likely that their children will have better opportunities to succeed financially than they had, including 30 percent who say it is "very" likely. 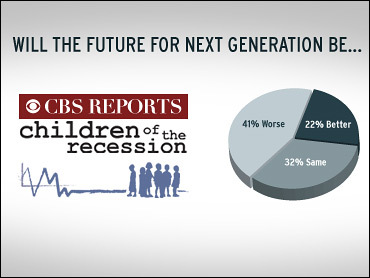 Even those greatly impacted by the recession are upbeat about their children's opportunities to succeed financially. As noted in a portion of the poll released Monday morning, nearly four in 10 parents say the recession is affecting the lives of their children. Among those parents, 85 percent say the recession has had "some" or "a lot" of impact on their plans for their children's future. When asked what concerns them most about the impact of their financial situation on their children, 36 percent of parents expressed concern over being able to afford tuition or pay for college. Six percent said their top concern was paying for health care, another six percent expressed general concern, and four percent were mostly concerned with not being able to provide for their children generally. The recession has not just brought perceived pain to American families; many have felt a tangible loss. Thirteen percent of parents say they are out of work and looking for a job, and 18 percent of parents say someone who provided a main source of income to the household has lost their job in the last six months. Forty-two percent of parents reported a decrease in the amount of their total household income in the last six months. Many parents say that the recession has meant they have had trouble paying for some basic necessities. For 52 percent of parents, it has been harder to pay for food in the last six months because of the recession. Nearly as many have had a harder time paying their utility bills. A third has had a more difficult time paying their family's medical bills, their mortgage or their rent. Among parents with a child in school, 30 percent have had a harder time paying tuition or another school fee. Concern about paying those bills over the next year is even more widespread. About six in 10 parents are very or somewhat concerned about paying for necessities such as food, utilities, medical bills or housing. READ MORE: "Poll: Spending On Children's Health Care"
One in three parents has cut back on their child's extra-curricular activities such as after-school programs and activities, after-school tutoring and test preparation as a result of the recession. One in five are relying more on their friends, family and neighbors for food or financial assistance, or have started to use a school meal program. Thirteen percent have started to use food stamps, a community food pantry or food bank because of financial problems resulting from the recession. Half of parents say they have made changes to their summer vacation plans as a result of the recession. Forty-four percent of parents say they have put off a major purchase because of the recession and the financial insecurities it has brought. Parents are talking with their children about the recession. More than half have discussed the nation's economic problems, and half have talked about their own family finances with their children. Fifteen percent of parents say their own financial problems should not be discussed with the children, while 23 percent say their children are not old enough for the discussion. Eleven percent of parents say they have simply not yet brought it up. In addition to the impact the recession is having on the family budget, it is also causing stress for parents. Nearly two thirds say that not having enough money contributes to stress in their lives at least somewhat often. Most parents have not noticed any changes in their children's behavior as a result of any financial changes in their household, but 17 percent have. Parents report that their kids have expressed anger, been stressed and anxious about finances, generally disappointed about the family not being able to afford things they used to and have become more aware of finances and ask questions. Despite the negatives, the recession may be having a positive impact on some families. Eighteen percent of parents say that the recession has caused them to spend more time with their children, compared to just 11 percent who say less time. Seven in 10 are spending the same amount of time with their kids. This poll was conducted among a random sample of 1,874 adults nationwide, interviewed by telephone May 6-12, 2009. Phone numbers were dialed from RDD samples of both standard land-lines and cell phones. The error due to sampling for results based on the entire sample could be plus or minus two percentage points. The error for subgroups is higher. An oversample of parents or guardians of children under 18 living at home with them was interviewed, for a total of 972 interviews with these parents. The results were then weighted in proportion to the total composition of the adult population in the U.S. Census. The margin of error for the sample of parents is three points.